I am fortunate that my job doesn’t clip my fashion wings. (ie: distressed jeans are totally acceptable in the workspace). I do find a tailored pant from time to time adds the sophistication I sometime secretly miss. My go to classic black trouser has always been Theory. Their clean lines and equally structured blazers are the perfect closest staple. However; these cropped tuxedo pants from Barneys were perfection with their navy stripe and shorter hem. 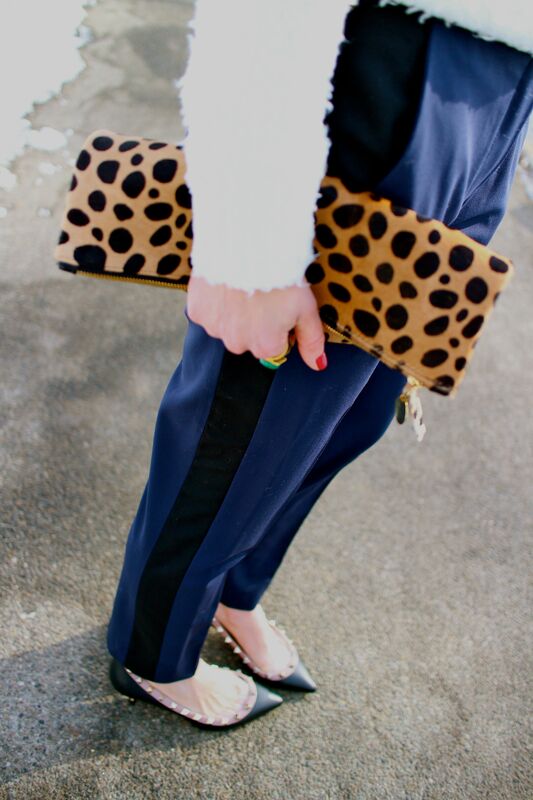 Clutch: Clare Vivier (also love the flat version), Pants: Barneys-ON SALE! (similar here & here), Shoes: Valentino, Sweater: Rag & Bone (similar here & here), Ring: Vintage (similar here & here), Sunnies: Barton Perreira (similar here & here). One of my favorite ways to relax is stepping through the doors of the Charleston Place Hotel in South Carolina. It’s old Southern charm is so welcoming and with full Christmas trimmings, it’s a stunning way to spend an afternoon. I typically avoid frilly, girly skirts (even being from the South), but I just couldn’t resist this one. With chunky jewellery and a denim jacket, I found a balance that I could work with. I know the minute I step off the plane in mid December on the East Coast, I will wish I had invested in all those fur lined cardi’s and sweaters. Fortunately, my lack of decision making lead me to the perfect solution…a fur accessory. I can literally add this cozy furball to any piece in my closet and viola…..perfection!